The Kendall Sorb-It Drain and I.V. Spongesis a lower cost alternative to premium sponges. Pre-cut notch conforms well around drains, catheters, chest tubes, I.V. 's and tracheotomies. Eliminates the need for sterile scissors, conserves nursing time. 6-ply sterile, 2 in a peel back sleeve. I.V.Drain Split Dressing. Gauze material. Square, Slotted. Promotes Healing. Effective. Safe. Easy To Use. soft. works great for peg tubes, soft on skin. Effective. Easy To Use. Is precut . For suprapubic catheter . Long Term Use. I use it as a dressing around my suprapubic catheter. It's precut, so you don't have to mess with cleaning scissors to cut gauze pad. Promotes Healing. Effective. Safe. Easy To Use. daily dressing changw. Long Term Use. parapeligic. Spinal cord damage. suprapubic catheter. Used to surround auprapubic catheter tube entry point into abdomen to prevent normal leakage and prevent dirt and germ contamination. Changed daily after shower or sponge bath. Great dressing for PEG tube! Promotes Healing. Effective. Safe. Easy To Use. Convenient. Long Term Use. PEG tube stoma care. Protects clothing . I care for my Mother. I use these 4x4 split drain sponges to cover the stoma surrounding my Mother's PEG tube. They are a good product to have for this purpose. I use one piece of tape to keep the dressing closed so that the tape doesn't have to touch my Mother's skin. I like the convenience of the slit. Long Term Use. I will use long term due . to gi tube . Novice First Aid Skills. caregiver. The product is used daily for dressing a gastric drain and it works really well. It absorbs any leakage of gastric juices and properly used and changed will help prevent skin erosion/irritations. 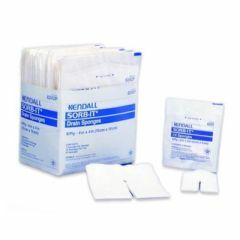 There is another Kendall sorb-it slit sponge that has antibiotic features that works well also, however, these are well made and economical especially if you have to change more than once daily.